JTAGbox is a standard ARM JTAG debugger in a heavy metal case for professional use. It is based on OpenOCD and FTDI’s serial protocol converter chip, widely used for On-Chip debugging and In-System Programming as a quasi standard. Input and output are galvanically decoupled. – So, maximum safety is inherently provided for your precious prototypes. The case is supported by rubber bed-plates and heavy enough, that it will not slip away all the time, like other cheap JTAG debuggers do. 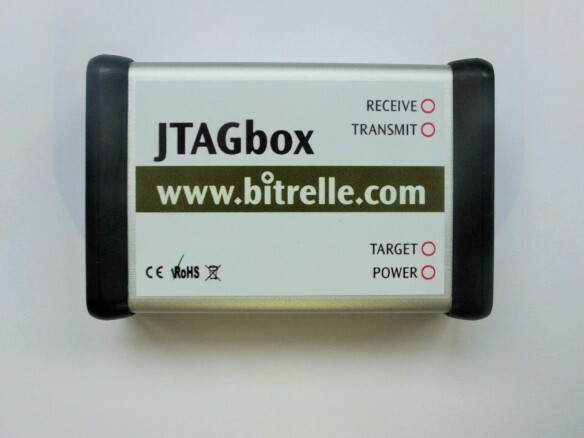 The JTAGbox provides a standard 20pins ARM JTAG connector as well as a Mini-USB cable. Together with the popular free and open source debugging software OpenOCD, it works perfectly not only with our own ARM based boards but also with many other ARM cores like ARM7, ARM9, ARM11, Cortex A8 and A9, and Cortex M series. Four LED’s provide complete control about input and output powering as well as data sending/receiving. Click here to get to the product side. Die Bitrelle GmbH ist auf den Gebieten des Automotive und Medical Engineering seit vielen Jahren ein verlässlicher Zulieferer und im Bereich Software und Hardware breit aufgestellt. Unsere Ingenieure werden von uns selbst in Berlin zu Embedded Experten ausgebildet und verstärken ihr Entwicklungsteam spürbar. Wir arbeiten in Berlin oder vor Ort bei Ihnen.